Having kids means tracking their milestones. You remember when they took their first step or said their first words. You also remember when they took their first swing. Equally important is when they out grow things like clothes, baby furniture and that swing set. You might want to hold onto some of those items for sentimental value but there are some things like the backyard swing set that are better off getting rid of. Dismantling a backyard playground could be a bit of a challenge if you were to do it on your own. However, if you hire Junk King for your swing set removal, you’ll be pleasantly surprised at how fast and affordable that task will become. The Junk King crews working around San Diego get an early start of the day. There are many appointments that have to be taken care of before the homeowner goes to work. Junk King is all about working around your schedule. Because the crews are already up and working, you might be able to score a same day service appointment. 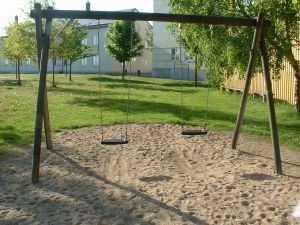 Call in the morning and before dinner time your swing set removal can be finished. At the very least, Junk King likes to take care of business within 24 hours. That’s not a long wait to get rid of junk that has taken years to accumulate! After the Junk King crew has carefully dismantled your swing set, they’ll load up the pieces on the Junk King crew. Those are two things you don’t have to worry about: labor and truck rental. You also won’t have to concern yourself with getting rid of the junk. If you were to give up your Saturday to haul your own junk, you could find yourself waiting in a long line at the local landfill. Not a great way to spend your day off! Junk King knows all the short cuts. They might even avoid the landfill all together if they can donate your junk to a charity or recycling facility. If you want to make sure your carbon footprint is reduced, then turn your junk over to Junk King. You’ll also find that Junk King offers some of the most affordable rates in San Diego for this type of service. Call today for an estimate then add up what it would cost if you had to hire a crew and rent a truck. You’ll find that when it comes to swing set removal and general junk hauling, Junk King is the only way to go. This entry was posted in San Diego Swing Set Removal and tagged Junk King, Swing Set Removal on June 29, 2014 by John Bonavita. Last updated August 1, 2017 .